If this card is Normal Summoned: Place 1 Spell Counter on it (max. 1). Gains 300 ATK for each Spell Counter on it. You can remove 1 Spell Counter from this card, then target 1 Spell/Trap on the field; destroy that target. This card is one of six cards to have been Forbidden in the past, but are currently Unlimited. The other five are Injection Fairy Lily, United We Stand, Call of the Haunted, Spore and Tsukuyomi. Recently, Magician of Faith joined the list. This monster appears in the artwork of Spell Vanishing, Defense Seal Wall, Prideful Roar and Magical Mid-Breaker Field. Breaker's emphasis is on his ATK and sword; Defender's is on his DEF and shield. Breaker is DARK, while Defender is LIGHT. Their color schemes are also the opposite of each other; Breaker's armor is red while Defender's armor is blue. Their effects are also opposites of each other, since Breaker's effect destroys Spell or Trap Cards, while Defender's effect protects Spellcasters (hence the names). This card has acquired its own term. To break a Spell or Trap Card is to destroy a card with this card's effect. The Spell Counter symbol is shown in multiple areas of this card's artwork, such as the background and on the orbs of Breaker's armor. It has nine Spell Counters on its armor and weapons (seven of them are visible in this card's artwork, while the other two can be seen in the artwork of Spell Vanishing). This card has several counterparts. Synchro: Arcanite Magician and Explosive Magician. "Genex Ally Crusher: Player A (the turn player) controls a face-up "Genex Ally Crusher" and Player B controls a face-down "Bottomless Trap Hole". Player A Normal Summons "Breaker the Magical Warrior". Since after a successful Summon all Trigger Effects must be activated first before players can respond with other card effects to the Summon, Player B will not be able to activate "Bottomless Trap Hole" until Player A has the chance to activate the Trigger effect of "Genex Ally Crusher". There are two Trigger effects being activated at this moment, "Breaker the Magical Warrior" and "Genex Ally Crusher". When a card like "Breaker the Magical Warrior" or "Magical Marionette" has no Spell Counters on it, you can activate its effect and remove the Spell Counter(s) from "Magical Citadel of Endymion" instead. 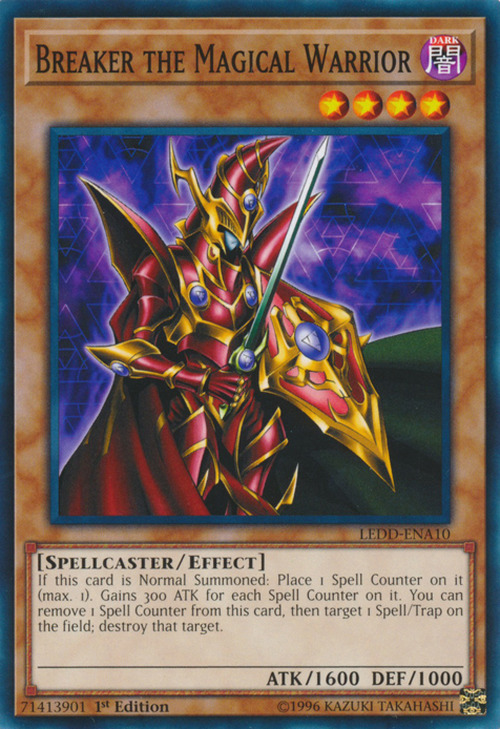 : When "Breaker the Magical Warrior" has no Spell Counters, can a Spell Counter be removed from "Magical Citadel of Endymion" instead as an activation cost? Inverse Universe: When "Inverse Universe" resolves, its effect replaces the monster's ATK and DEF values. : How is the ATK of "Breaker the Magical Warrior" replaced by "Inverse Universe"? Placing a Spell Counter on "Breaker the Magical Warrior" is a chain that begins after it is Summoned. If your opponent chains "Trap Hole" or "Ring of Destruction" to the placement of a Spell Counter on "Breaker the Magical Warrior", "Trap Hole" / "Ring of Destruction" resolves before the Spell Counter is placed on "Breaker the Magical Warrior", so you cannot chain "Breaker the Magical Warrior"s effect. "Breaker the Magical Warrior"s effect is Spell Speed 1 so you cannot chain it to the activation of a Spell Card. You can use "Breaker the Magical Warrior"s effect multiple times in the same turn as long as you can keep re-supplying him with Spell Counters (using "Pitch-Black Power Stone", etc.). Removing a Spell Counter is a cost; if you remove a Spell Counter from "Breaker the Magical Warrior" and your opponent chains "Ring of Destruction", the Spell Counter has already been removed so "Ring of Destruction" deals 1600 damage to each player; "Breaker the Magical Warrior"s effect that destroys a card is still applied even though "Breaker the Magical Warrior" himself has been destroyed at that point. If I chain "Ring of Destruction" to the placement of a Spell Counter on "Breaker the Magical Warrior", "Ring of Destruction" does 1600 damage to each player because the action of placing the Spell Counter has not resolved.The latest print of "Ring of Destruction" uses Problem-Solving Card Text, which states that the damage dealt is equal to the monster's original ATK. This difference is due to a major change in the functionality of "Ring of Destruction". Enemy Controller: If your opponent Normal Summons "Breaker the Magical Warrior", "Breaker the Magical Warrior"s effect to place a Spell Counter on him activates, and you chain "Enemy Controller" to that effect and take control of "Breaker the Magical Warrior". In that case, resolve "Enemy Controller" first and "Breaker the Magical Warrior"s effect of placing a Spell Counter second. Light and Darkness Dragon: When a monster is Summoned that has an effect that activates at the time the monster is successfully Summoned (“Zaborg the Thunder Monarch”, “Breaker the Magical Warrior”, etc.) while “Light and Darkness Dragon” is face-up on the field, the effect of the Summoned monster will be Chain Link 1 and “Light and Darkness Dragon” will be Chain Link 2. Because of this, it is not possible to use “Pulling the Rug” to negate the effect of the monster if it was Normal Summoned. Pitch-Black Power Stone: You can use a Spell Counter from a card like "Breaker the Magical Warrior" and replace "Breaker the Magical Warrior"s Spell Counter with "Pitch-Black Power Stone" on the same turn (and use "Breaker the Magical Warrior"s effect again that same turn, if you wish).